A strong outboard adds zip to a boat, as long as you know how to start it. 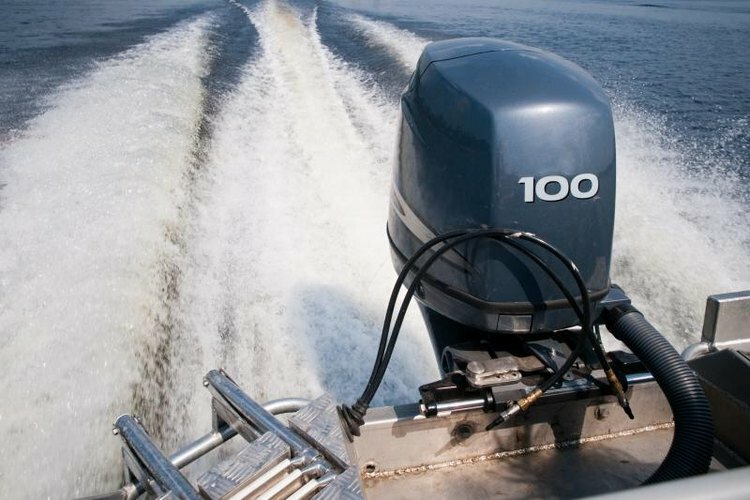 Outboards come with two types of starting systems, electric and recoil. Recoil starters are similar to those in power equipment such as chain saws, lawn and garden equipment and small generators. Electric starters are the analog of the starter in your car. Many outboards with electric start systems come equipped with recoil starters as a backup system. Check your engine operator's manual to determine if your engine has this feature. Not all outboards have a kill switch. If your outboard does, attach the lanyard with the metal tab to your wrist. This tab controls the dead-man switch, the kill switch that shuts down the outboard, should you fall overboard. Insert the metal tab into the kill-switch slot, located at the throttle handle and gear shift, located remotely from the outboard. Insert the key into the ignition key switch. This key operates in the same way as your car's ignition switch, with "Off," "Start" and "On" positions, or it may have only "On" and "Off" positions. On outboards without an electric starter -- those with a pull-rope -- the key switch has only "On" and "Off" positions. Move your gear shift or combination throttle/gear shift into "Neutral." Turn the key to the "On" position, to activate the engine gauges. Take note of the engine temperature. If the temperature gauge shows the engine's temperature to be lower than the normal operating range, move the throttle to the "Start" position, to set the choke. Most modern, carbureted outboards have an automatic choke. Turn the key to the "Start" position or press the "Start" button. Release the key or "Start" button as soon as the engine starts. Sit down next to an outboard equipped with a recoil-type rope-pull starter. Locate the kill-switch slot next to the engine's throttle twist handle. Insert the metal tab on the lanyard into the kill switch, if you engine has a kill switch. Note the engine's temperature. Pull the choke knob out fully if the engine's cold. Turn the throttle -- the twist-handle on the throttle-control/steering arm -- to the "Start" position. Move the twist handle to the "Neutral" position. After you do so, pull the starting handle, attached to the starting rope, toward you until you feel the slack come out of the rope. The recoil starter on an outboard operates the same way as the recoil starter on a lawnmower. Pull the recoil handle, located on the end of the starter rope, toward you to take the slack out of the rope. Pull the handle vigorously, to prime the recoil starter. When the starter engages the engine, it releases its hold on the rope. If the engine starts, release the rope, slowly, and push the choke knob in, slowly. You must turn the twist-handle to the "Run" position -- sometimes marked as the "Shift" position -- in order to change gears. If your outboard fails to start on the first try, regardless of the type of starter, wait 10 seconds before you try to start it again. After the third try, allow the starter to rest for two minutes before you try it again. On those so equipped, you must release the engine cover latch and remove the engine cover to access the recoil starter. Never stand up in your boat to "get leverage" when you're trying to start an outboard equipped with a recoil starter. Your efforts will eventually throw you overboard. Never operate your outboard out of the water unless you provide a source of cooling water. Use the motor's flushing port or connect a flushing attachment to a garden hose and place the attachment over the cooling water inlets. You may also immerse the motor in a motor test tub filled with water so that the cooling water inlets are submerged. Disconnect the negative cable of the boat’s battery before performing any maintenance work on the boat’s engine, using a 5/16-inch box end wrench. Lift the cable from the battery, move it outside of the battery box and close the lid of the battery box. After the work is complete, reconnect the negative battery cable. Whenever you work on your boat’s engine, remove the propeller nut with a propeller wrench. Slide the thrust hub, propeller and washers from the propeller shaft. Failure to remove a propeller before working on an engine that’s out of the water is an invitation to a propeller-strike injury, which can maim or kill.